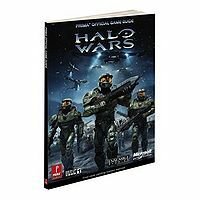 The Halo Wars Official Guide is the official guide of Halo Wars. It was released alongside the game (27 February in Europe and the 3rd of March in North America), published by Prima Publishing. Full-color maps of all the Campaign and Multiplayer locations. Tactics for the Campaign mode, including battle-tested plans for Cooperative play, and for Legendary difficulty setting. Shows methods to build your base in the quickest and best ways. Every single UNSC and Covenant troop, unit, vehicle, and aircraft is showcased, along with any information about it such as upgrades, weaknesses, and advice on using them to tactical advantage. Every hidden Skull and Black Box located and tested, including a complete Halo timeline. Exclusive detailed biographies of the six leader characters and AI Serina. The tech level required for the Scorpion's 'Canister Shell' ability is 3, not 4 as the book states. In the description of the Boomstick Skull, the Look Daddy Skull icon is displayed. The skull section says that all skulls raise your score, while some lower it. The Type-30 Locust is described as being unable to attack air units. The book implies that General is a navy rank while it is not. The Rhino is said to only appear on Dome of Light when it also appears in Scarab. In Escape, it states you fight Covenant, Flood and UNSC, however, you actually fight Covenant, Sentinels and Flood.